This lecture examines in detail a rare stone carved-stele illustrating a momentous event in the life of the Buddha. 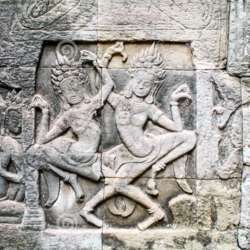 This stele was found at Angkor Wat and dates to the 13th–14th century. This unique relief was originally discovered in the late 19th century in the gallery of a “Thousand Buddhas” (Preah Poan) inside Angkor Wat; it is now located at the National Museum of Bangkok. The stele depicts the miraculous Birth of Śākyamuni Buddha, born as Siddhārtha Gautama, coming from the side of his standing mother, Queen Māyā, in the Lumbini grove. This lecture discusses the provenance and travels of this stele from Angkor to Bangkok and interprets its style and iconography. By comparing this stele with other artistic representations of the Birth of the (future) Buddha and various textual sources, this case study aims to better date and understand the advent and uniqueness of Theravāda Buddhism at Angkor—centering on the Life of the Buddha—in the context of the Buddhist transformation of Angkor Wat during the pre-modern period. Dr. Nicolas Revire has lectured at Thammasat University in the Faculty of Liberal Arts since Protected content . In Protected content completed a doctoral degree at the Université Paris 3–Sorbonne nouvelle in France. He specializes in the Buddhist art and archaeology of South and Southeast Asia, with a research focus on pre-modern Thailand and Cambodia. He is general editor of a collective volume titled Before Siam: Essays in Art and Archaeology and co-published by the Siam Society (Bangkok, Protected content .